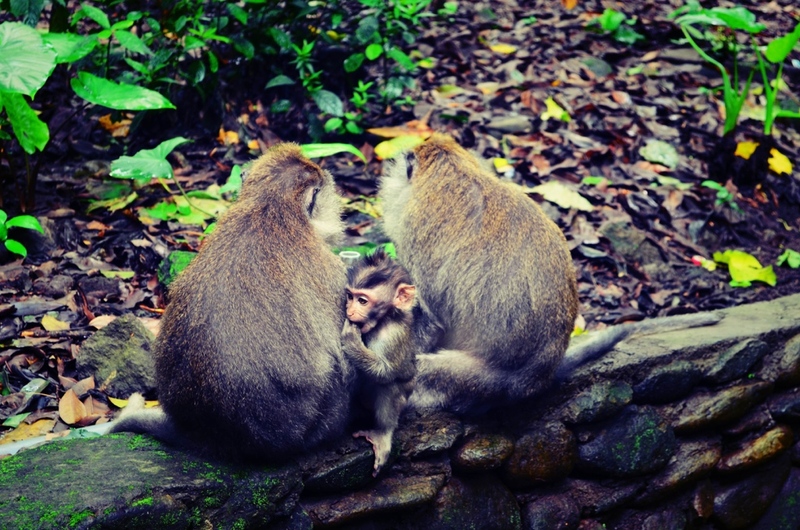 The main places to stay in Bali are Kuta or Seminyak – before I went, everyone would ask me if I was staying in Kuta or Seminyak…but I actually didn’t stay in either of those! As I’d heard that they are fast becoming more and more touristy and full of drunk rowdy foreigners (mainly Australians!! ), we decided to stay a bit further out in Uluwatu in the south of the island. It really felt like we were in ‘real’ Bali – it was really lovely for a few days relaxation in a nice hotel. To be honest, eating and drinking wise in the evenings, there isn’t really much there at all. And you definitely need to rent a motorbike if you’re keen to explore the area a bit. Head to the really beautiful Dreamland Beach for the day – the waves can get really big here though (there were a few tsunami warnings telling you what to do in the event of one – which scared me!) so if you’re wanting to swim, head there in the morning as the sea is calmer! The main attraction in the area is Uluwatu temple, which is apparently worth going to in time for sunset – we didn’t actually visit it as we just literally wanted to relax after weeks and weeks of doing tours and trips every other day, but I now wish we had seen it while we were there! Ubud is an amazing, amazing place! 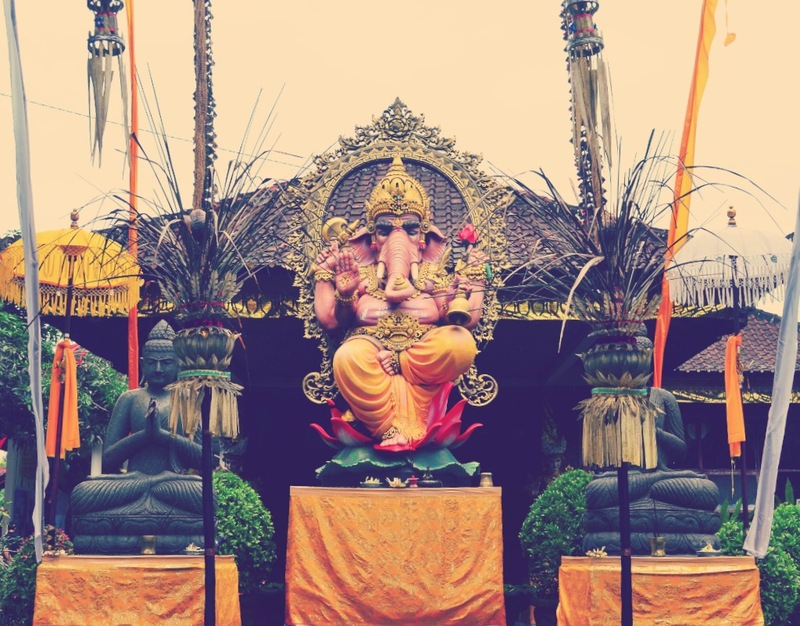 It is the cultural heart of Bali and was the most perfect way to end our time there. One of the main things we noticed about Bali was how genuinely lovely and friendly the people are – everywhere else we’d been, we’d felt like the only reason the locals spoke to you was to try and sell you something, but here it was completely different – I really felt like they were just interested and wanted to get to know you – in the shops, the restaurants and bars, which was such a refreshing change! Beautiful local goods – amazing shopping! 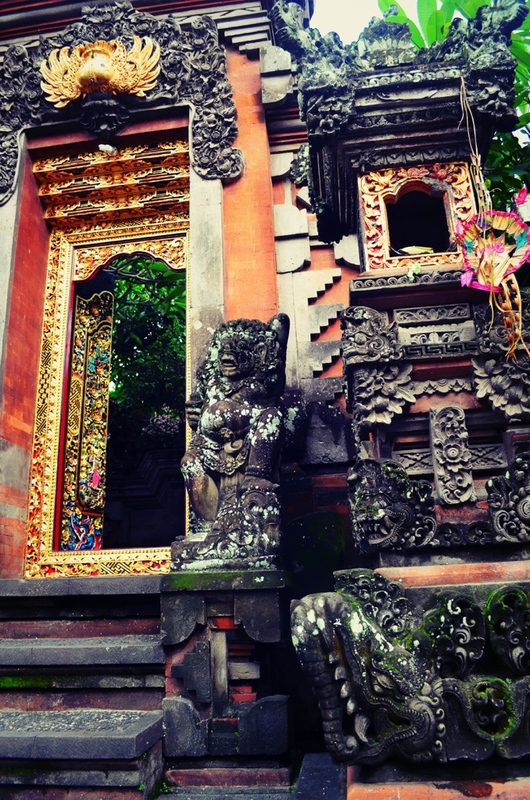 The town is full of beautiful local handmade arts and crafts, Balinese masks, clothing and souvenirs, as well as a meditation/yoga theme! You won’t be stuck on where to eat out as most places have a lovely local menu (although we did notice an unusually large number of Italian restaurants for some reason) and the Balinese food was definitely one of my favourites of the whole trip with typical dishes including fried eggs, noodles, crushed peanuts and rice crackers. As for bars, I’d definitely recommend spending an evening at the Laughing Buddha Bar, which is in Lonely Planet’s list of bars and restaurants. It’s not the cheapest of places but the cocktails are good, the atmosphere is buzzing and on most nights there is a live band for entertainment! As we were now in the centre of the island, the did notice a change in the weather…it was very humid and wet, and would rain everyday like clockwork (a shower in the morning, mid-late afternoon, and again in the evening). After the first day when we got stuck under the shelter of a supermarket for 2 hours in the torrential rain, we eventually got so used to it that we borrowed an umbrella from the hotel every time we went out. 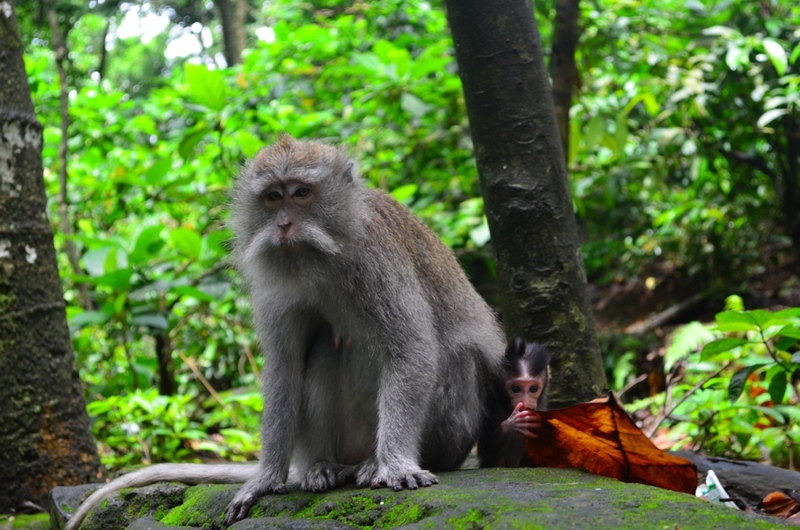 The highlight of my 3 days in Ubud has to be the Sacred Monkey Forest Sanctuary – it was such a fun afternoon. 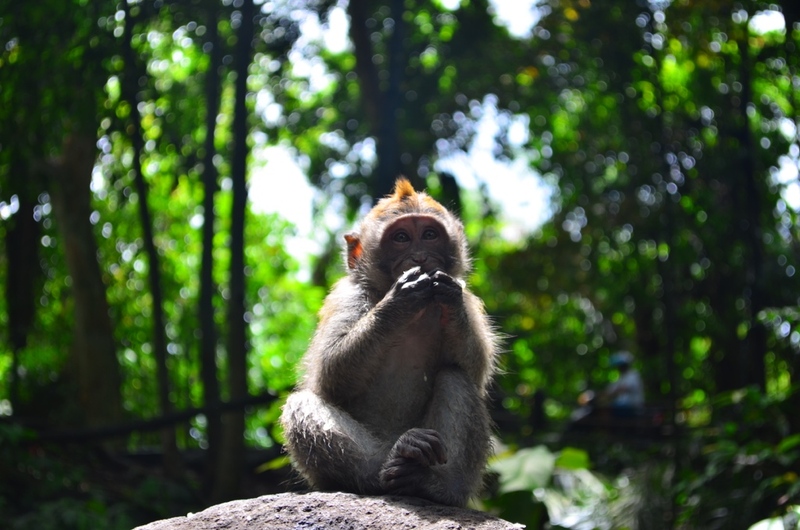 Once inside, you can buy a bunch of bananas to feed to the monkeys – but they are such clever and cheeky monkeys and they know as soon as you have them in your hand so be prepared to be pounced on! So many times we saw monkeys jump up onto people’s backs from behind and grab the bananas straight from them! 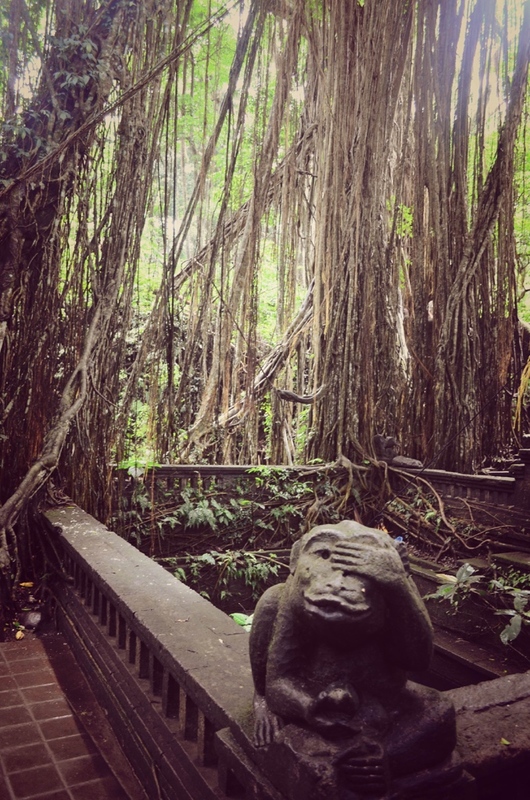 The monkey forest in itself is beautiful – amazing tree structures and roots and carvings and stone monkey statues everywhere. On another day, I would recommend booking a short half day tour to see the rest of what Ubud has to offer, which is plenty. Highlights include the Rice Terrace (amazing green views of the paddies, even though it had just started to rain when we stopped there); the Elephant Temple Goa Gajah, a small stone temple with a cave you can go into (in our case to shelter from the rain…) and the coffee plantation where they grow the famous Balinese ‘Luwak’ coffee which is actually an animal who eats the coffee beans in order to poo them out to make the product…But don’t knock it till you try it!! Ubud was our last stop in Bali and on our Southeast Asia trip as well, so we now excitedly awaited our next adventure which was AUSTRALIA!